To facilitate automation, a novel DNA extraction method for MRSA was adopted. The MRSA specific chromosome-SCCmec PCR was adapted, additional primers were added, and the performance was validated. From various laboratories in The Netherlands we received a total of 86 MRSA clinical isolates, that were negative in commercially available tests. We identified 14 MRSA strains with new variant chromosome-SCCmec junctions by sequence analysis. These MRSA strains appeared to carry SCCmec sequences with a high degree of homology to SCC regions of S. epidermidis and S. haemolyticus. All were included for detection in chromosome-SCCmec based PCR. Efficient management of Methicillin Resistant Staphylococcus aureus (MRSA) in the hospital is needed to prevent dissemination. It is important that MRSA can be rapidly identified, and effective infection control measures can be initiated. Equally important is a rapid MRSA negative report, especially for patients in isolation. For negative screening we implemented fully automated high through-put molecular screening for MRSA. Fourteen variant chromosome-SCCmec junctions in MRSA, that are not detected in commercially available MRSA detection kits were added to our PCR to detect all currently known variant SCC-mec types of MRSA. The dissemination of Methicillin Resistant Staphylococcus aureus (MRSA) in hospitals is a growing problem worldwide. In The Netherlands, a search and destroy policy is implemented . Patients colonized with MRSA are kept in isolation until they are culture negative. A MRSA negative report can faster be obtained by PCR. Therefore, a molecular approach for negative screening of MRSA was exploited. Molecular detection of the mecA gene, which confers resistance to all β-lactams, has often been used in combination with other S. aureus specific genes in a multiplex PCR. Genes that are specific for S. aureus comprise for example of the sequence published by Martineau et al. , the nuclease gene (nuc) [3, 4], or the coagulase gene (coa) . When clinical samples contain a mixture of coagulase negative staphylococci (CNS), methicillin sensitive S. aureus (MSSA), and MRSA, a positive mecA PCR can be generated by CNS while both MSSA and MRSA generate a positive PCR for the coa or the nuc gene. Only culturing could confirm MRSA. Another approach for detection of MRSA was presented by a multiplex PCR described by Huletsky et al. . This PCR specifically targets the junction between a conserved open reading frame orfX in S. aureus, and the staphylococcal cassette chromosome containing the mecA gene (SCCmec). For MRSA, 8 different types of SCCmec elements have been classified . The SCC is known to be a mobile heterogeneous genetic element that integrates site specifically into orf X. SCCmec is an SCC containing the mec A gene. SCC can also be present in CNS, not containing mecA but integrated into the analogous chromosomal location. MSSA can contain non-mecA-SCC or SCCmec elements which have lost the region containing mecA. Several commercially available molecular screening tests are based on PCR amplification of the chromosome-SCCmec junction. In this study, a novel DNA extraction method for MRSA was adopted that virtually prevents PCR inhibition. The detection process was fully automated for high through-put of clinical materials. An extra 17 forward primers were added to PCR to detect several newly identified MRSA strains in this study carrying SCCmec variants and found to be present in The Netherlands, and possibly elsewhere. An adaptable PCR format is needed for reliable detection of all MRSA. The PCR as described by Huletsky et al. , was slightly adapted (Table 1). according to Huletsky et al. adapted from Huletsky et al. To allow PCR detection of more MRSA types, a literature search was conducted. Forward primer F7 was derived from the sequence of S. aureus strain JCSC 3624 (WIS), accession number AB121219 , and was included in the PCR. Primer F10 was designed based on the sequence of S. aureus U10927  (Table 1). With the expanded orfX/SCCmec PCR a total of 1906 samples was investigated with high through-put screening; 303 were PCR positive, no inhibition of PCR was found. To verify whether a positive signal was due to viable or dead MRSA, all were cultured; 141 were culture positive, and 22% of 141 were found to be MSSA. The latter may have lost mecA regions or contain non-mecA SCC elements. All culture positive MRSA were confirmed by mecA/coa PCR. Thus, PCR is highly non specific. However, since all suspect samples are subsequently cultured, this is acceptable. With negative screening it is important that the negative predictive value is 100%. One MRSA isolate found by routine culture was negative in PCR. We analyzed the sequence of this strain (303480, Table 2) by genomic DNA sequencing with primer R1. A sequence of 345 bp was obtained which was aligned to Genbank/EMBL DNA sequences using BLAST. No significant sequence homology was found except that the 35 bp flanking orfX showed 97% homology with a repeated sequence found in S. haemolyticus (AP006716;bp 52313, and 91034), also present in S. saprophyticus (AP08934;bp 50105). A new primer in PCR (primer F8, Table 1) was derived from the obtained sequence. To minimize the chance for more false-negative PCR results for MRSA, other laboratories in The Netherlands were asked for MRSA strains that were negative in commercial molecular tests used by these laboratories. We received a total of 86 clinical isolates or DNA. Whenever a strain was also negative in our orfX/SCCmec PCR, DNA was sequenced and a new primer was added to PCR. Of 86 strains, another 14 additional forward primers were designed, apart from 2 literature based primers, and 1 primer based on a MRSA strain from our own hospital. All 17 primers were included in PCR to a total of 22 forward primers (Table 1). All 14 strains mentioned above were verified to be MRSA using mecA/coa PCR. All were positive in both PCRs. The results of DNA sequence analysis are presented in Table 2. BLAST comparisons were made with the sequences cut off at the orfX according to Ito et al. . Within the orfX gene, the obtained sequences were highly homologous and consistently aligned to S. aureus orfX. The SCCmec of 5 strains showed various degrees of homology (91-100%) with different parts of SCCmec sequences of S. aureus strains. Two MRSA strains showed 99% homology with S. epidermidis SCC, but with different regions. Another 3 strains were homologous to S. haemolyticus in their orfX flanking sequences. BLAST alignments of strains 303480 and 251110219 showed no significant sequence homologies except for a 35 bp repeat (CAACtTATTTTTTAGTTTTATTTGTGATACGCTTCT)found present in S. haemolyticus and S. saprophyticus. The orfX flanking regions of 3 other strains showed no significant homology to any Genbank/EMBL sequences. The alignment of right SCCmec-OrfX junctions is shown in Figure 1. The direct repeat consensus (--A-TT-TGATA-GC-TC, ) is largely intact, suggesting that SCC sequences from S. epidermidis and S. haemolyticus were acquired by recombination rather than by transposition. Alignment of right SCC-OrfX junctions. Strains are designated by the primers based on their sequences. OrfX starts at bp 55 (according to Ito et al. . SA; S. aureus, SE; S. epidermidis, SH; S. haemolyticus, SR; Staphylococcal repeats. Strains without any homology to known sequences were omitted from the comparison. The staphylococcal cassette chromosome SCCmec is a genetic mobile element that contains the methicillin resistant mecA gene . Its site-specific insertion or excision is mediated by cassette chromosome recombinase (ccr) complex and by the presence of direct and inverted repeats at the SCCmec extremities. The combination of classes of mec gene complex and ccr gene complex forms the basis of their classification . At present 8 types of SCCmec elements have been classified [7, 11]. In addition, SCCmec can harbour other drug resistant genes, and insertion sequence elements (IS 431, IS 1272), transposons (Tn4001, Tn554) or plasmids (pUB110, pT181). The chromosome flanking regions (junction or J-regions, formerly, junkyard regions) of SCCmec are most variable in their DNA sequences. We adapted the PCR described by Huletsky et al. , based on amplification of the chromosome-SCCmec junction. We initially included 2 more forward primers to expand detection to MRSA known from literature. After sequence analysis of 14 MRSA strains that were not recognized by the initial primer set, we included additional primers resulting in a megaplex PCR with 14 primers based on sequences of newly identified MRSA with variant SCCmec sequences to a total of 21 forward primers. No adverse effects on PCR were seen with this number of primers. From 3 strains the sequenced SCCmec region did not match any known DNA sequence, presuming a non-human relation. In The Netherlands live-stock associated MRSA is increasingly isolated . Reischl et al. have shown that live-stock associated MRSA can be discriminated on the basis of a G→A mutation in orfX. Based on the finding that these strains were only positive in PCR when the probe harbouring this mutation (probe 2) was used, we confirmed that these 3 strains were most probably live-stock associated MRSA. In the SCCmec of the other new strains, repeated sequences as IS 431 and IS 1272 were found. IS elements are mobile and can move by transposition. The similar but not identical repeats found in strain 303480 and 251110219, might be related to an IS 1272 encoded truncated transposase as was indicated by BLAST homology. 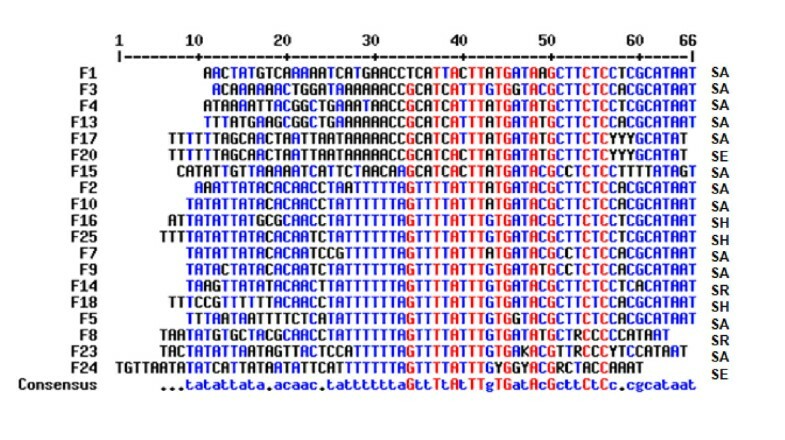 This suggested that the variant SCCmec sequences resulted from transposition. Therefore the right chromosome-SCCmec junctions carried by the new MRSA strains were compared. The consensus represented the direct repeat (DR) involved in insertion and excision of SCCmec. Consequently, the variant SCCmec sequences were acquired by recombination rather than transposition. Mongkolrattanothai et al. , reported a non-mecA-SCC element present in S. epidermidis with 3 DR highly homologous to S. aureus, 2 at the extremities of the element and 1 in the middle. The 2 MRSA strains carrying different SCC homologs of S. epidermidis in this study, were each highly homologous to the SCC described by Mongkolrattanothai , but represented the sequence on either side of the middle DR. This finding may corroborate the recombination theory, regardless of the orientation of the inserted SCC in the 2 MRSA strains. Whether mecA is carried on the acquired SCC from S. epidermidis of the MRSA strains found in our study, as well as SCC typing, remains a topic for future studies. In conclusion, it appears that MSSA can convert to MRSA by acceptance of SCC sequences from CNS. This process may be driven by selection pressure of antibiotics. Indeed, an isogenic pair of MSSA and MRSA was recently described that supports the occurrence of horizontal transfer of SCCmec between Staphylococcal species . The 86 strains not detected as being MRSA in other laboratories by commercially available tests raises concern about their performance [16, 17]. Exploiting the SCCmec junction as target in PCR used for detection of MRSA requires continuous awareness of possible variants. PCR based on mecA/nuc gene does not seem to present an acceptable alternative because the nuc gene may be absent as has been found earlier . The mecA/coa PCR, combined with chromosome-SCCmec junction PCR identifies other MRSA variants that may arise. We identified 14 new variant chromosome-SCCmec junctions in MRSA, that are not detected in commercially available MRSA detection kits. We adapted our PCR to detect all known variant chromosome-SCC-mec types of MRSA. Fully automated high through-put detection and robust DNA extraction support an adaptable PCR format for detection of these newly identified MRSA strains. Moreover, this system can easily be expanded with novel PCR primers when new variants of chromosome-SCCmec types in MRSA may arise. Samples were taken from nose, throat, and perineum, and if appropriate also from wounds, sputum, and catheters (Transwab, Medical Wire & Equipment Co. Ltd., Corsham, Wilts., England) in the context of patient and personnel screening as required by the Dutch policy for MRSA control. Since no extra action or sampling was requested than the medically indicated, informed consent was not asked and no ethical approval was required, in conformity to the guidelines of the Dutch Central Committee on Research involving Human Subjects. Swabs were inoculated into 5 ml phenyl mannitol broth (PHMB) containing ceftizoxime and aztreonam  for overnight incubation. After at least 18 hours of incubation, PHMB broth was subjected to PCR. PHMB tubes were placed into the MultiPROBE II PLUS HT Expanded pipetting robot (PerkinElmer Life and Analytical Sciences). This system is equipped with a bar-code reader and automated plate sealer (RoboSeal). This system handles the DNA extraction, PCR assay set-up, and sealing of the plate. Next, the plates are automatically transferred to a real-time ABI 7900HT thermocycler (Applied Biosystems, Nieuwerkerk a/d IJssel, The Netherlands). Thus, barcode scanning, DNA extraction, pipetting, sealing of the 384-well PCR Plate, creating a run file and starting the PCR, were done by the system without interference or need of presence of a technician. Results were automatically transferred to the Laboratory Information System. Software was programmed by PerkinElmer to perform the following steps. After barcode reading, 5 ml of saline was added and mixed by pipetting. This 1:1 dilution served to elevate the fluid level and to prevent the 9.5 cm long probes touching the swabs in the 15 cm long tubes. Template DNA was prepared by using the Extract-N-Amp™ Plant PCR Kit (SIGMA, Munich, Germany). In short, 50 μl sample was mixed with 100 μl SIGMA Extraction Solution (E7526). The mixture was incubated at 95 °C for 10 minutes, cooled to room temperature, 100 μl SIGMA Dilution Buffer (D5688) was added and mixed. This DNA sample is PCR ready when used in combination with the SIGMA Extract-N-Amp PCR ReadyMix™ (E3004). Primers and probes for detection of the OrfX-SCCmec junction were used in one primer-probe mixture with the following concentrations; 600 nM for each F and R primer, and 120 nM for each probe (Table 1). Each sample was tested with this primer-probe mixture. Amplification reactions were performed in a volume of 20 μl, with 10 μl SIGMA Extract-N-Amp PCR Reaction Mix™ (including 4% Reference Dye) in 6 μl primer-probe mix and 4 μl of the DNA sample. Amplification consisted of 3 min at 95 °C followed by 44 cycles of 15 s at 95 °C and 60 s at 60 °C. In each run a MRSA positive and a negative control was included. A sample was regarded suspect for MRSA in the MRSA-screen if the PCR was positive. Positive samples were subsequently cultured on blood agar plates. The mecA PCR was carried out as described , with 800nM of each primer. PCR for coa was as described previously . The concentration of primers Coag2: CGAGACCAAGATTCAACAAG, and Coag3: AAAGAAAACCACTCACATCA was 800nM each. MecA/coa PCR was used to confirm MRSA isolates. Results of mecA and coa PCR were analyzed using agarose gel electrophoresis. Sequence analysis was performed by Baseclear, Leiden, The Netherlands on total chromosomal DNA with primer R1 (Table 1). Partial sequences of variant SCCmec have not yet been submitted but will be classified in further studies according to the recommendations of the International working group on the classification of staphylococcal cassette chromosome elements . We gratefully acknowledge our colleagues who kindly provided their strains; Anneke Bergmans PhD., and Jan Kluytmans PhD., Amphia Hospital, Breda, Adriaan van den Brule PhD., Lab for Medical Microbiology, PAMM Regional Laboratory, Eindhoven/Veldhoven, The Netherlands, Eric Claas PhD., University Medical Center, Leiden, Ad Fluit PhD., and Adrienne Box BSc, University Medical Center Utrecht, Utrecht, Gerda Noordhoek PhD., Centre for Infectious Diseases Friesland, Leeuwarden, Ron Hendrix MD, PhD., Labmicta, Enschede, Mirjam Hermans PhD., Jeroen Bosch Hospital, Den Bosch, Ludo Oostendorp BSc, Laboratory for Infectious Diseases, Groningen, Dorthe Ørnskov, PhD, Sygehus Lillebælt, Vejle (Denmark), Thera Trienekens PhD., VieCuri Medisch Centrum voor Noord-Limburg, Venlo. AZ drafted the manuscript and carried out the analysis of data. LR carried out the molecular genetic studies, and participated in the design of PCR. WDHH and JB conceived of the study and participated in its design. JMO helped to draft the manuscript. All authors read and approved the final manuscript.